The decriminalisation of homosexuality in 1993 was the end of a battle that began 16 years earlier in 1977, when David Norris introduced a case against the Irish government, saying his right to privacy was violated by the Offences against the Person Act 1861 (which criminalised “buggery”) and the Criminal Law Amendment Act 1885 (which criminalised “gross indecency”). Norris’s Senior Counsel was fellow member of the Campaign for Homosexual Law Reform, Mary Robinson. The Irish courts ruled against Norris, and so he took his case to the European Court of Human Rights, charging that Ireland’s criminalisation of homosexual acts between consenting adult men was in breach of Article 8 of the European Convention on Human Rights. 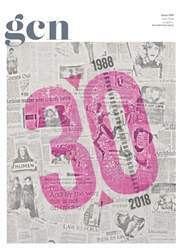 The case was decided in 1988, the same year that GCN was first published, but the Irish government did not respond by changing the law for another five years.